The Prattle Equities Analytics Data Feed uses a combination of natural language processing, sentiment analysis, and machine learning to deliver comprehensive quantitative analysis of corporate earnings calls from nearly 3,000 publicly traded companies in the United States. The Prattle Equities Analytics Data Feed uses a combination of natural language processing, sentiment analysis, and machine learning to deliver comprehensive quantitative analysis of corporate earnings calls from nearly 3,000 publicly traded companies in the United States. Company language and word choice is turned into quantitative data that helps investment professionals forecast their market impact. The product information and content statistics contained in this document are as of July 2018. Leverage Prattle scores to more effectively monitor a large universe of stocks to identify those that warrant further attention. Prattle’s scores capture price-relevant factors that are not captured by a company’s fundamentals. The Prattle Equities Analytics DataFeed covers more than 150,000 corporate earnings calls for a universe of over 3,000 publicly traded companies in the U.S. 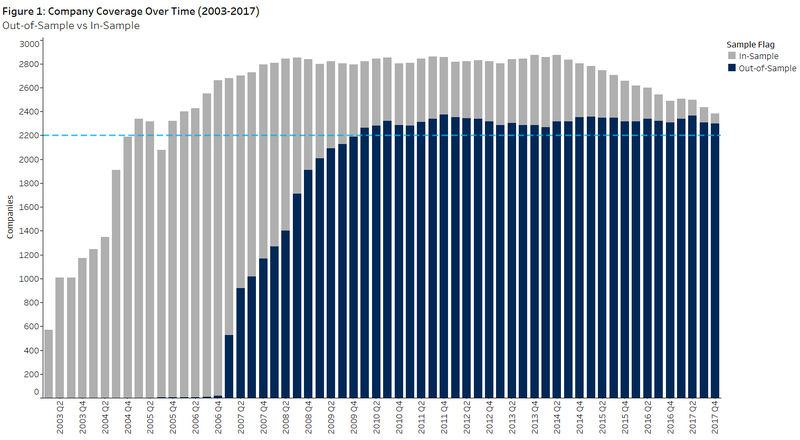 Figure 1 depicts company coverage over time based on in- or out-of-sample coverage. Prattle’s out-of-sample coverage begins in 2006 with consistent coverage for over 2,200 companies since 2010 (More information on this methodology can be found in The Differentiators section below). 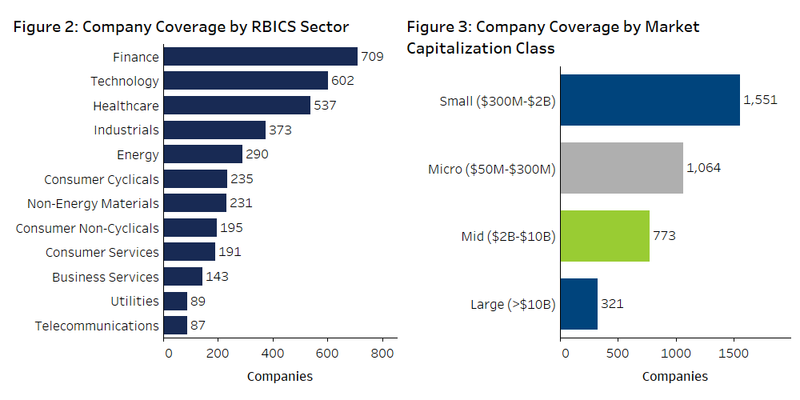 Figure 2 highlights company coverage by RBICS sector and Figure 3 showcases coverage by market capitalization. 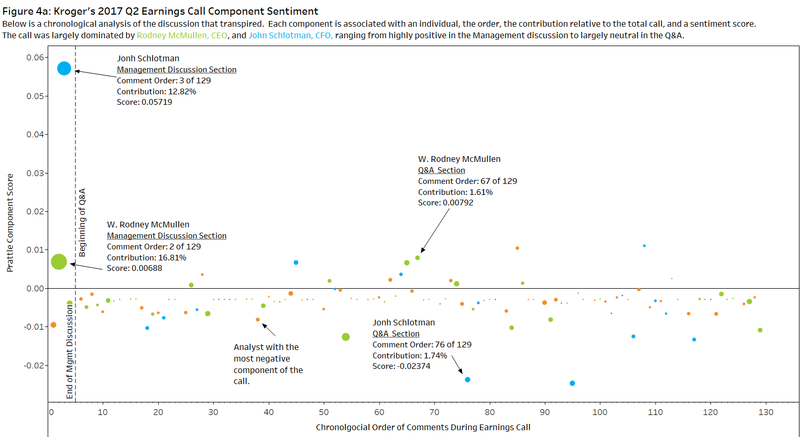 Prattle’s company-centric approach examines the relationship between linguistic patterns of participants on corporate earnings calls and stock price movements. To develop a unique lexicon of scored expressions (words, phrases, sentences, or event whole paragraphs) valued in terms of their impact on stock price movements for each company, Prattle requires at least 16 quarters of historical earnings calls. It uses these company-specific documents to create an algorithm. Once the algorithm is fully trained, machine learning is used to dynamically add and adjust the weightings associated with new and old expressions. This approach is used to produce three scores: component scores (the sentiment of specific individuals on a call), the CAR Score (the expected short-term change in stock price, relative to the market benchmark, based on the language of the earnings call) and the Prattle Score (contextualizes the event’s CAR score by examining the difference between it and the average of the previous four). Figure 4a showcases the individual component scores for Kroger’s 2017 Q2 earnings call. 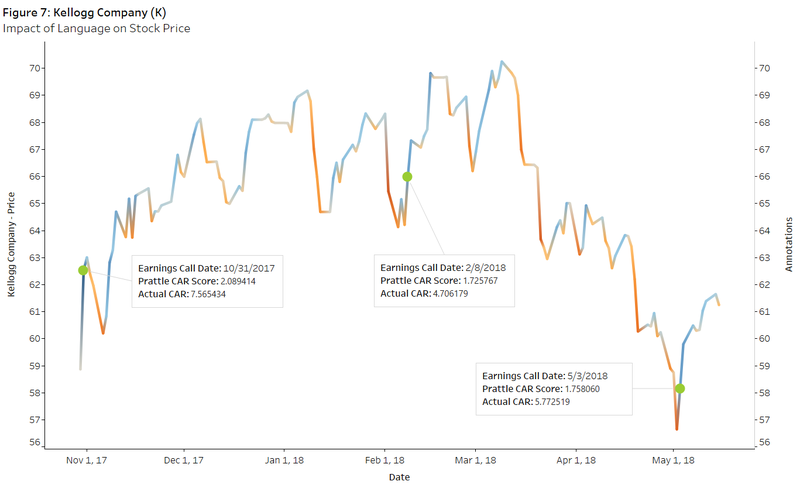 Prattle’s unique data systematically identifies earnings calls that are potentially market moving. A simple but powerful application of this content is to filter and prioritize companies whose sentiment has drastically deviated from prior events. 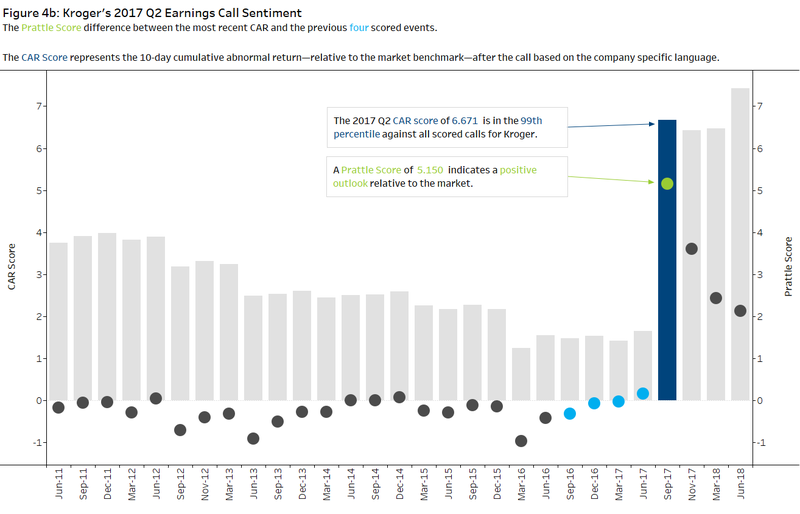 Figure 5 contains the 1,989 earnings calls covered by Prattle from January to the end of March 2018. This visualization shows how the Prattle Score (PS) can quickly identify companies that warrant further attention. The PS captures the difference between the sentiment of the current call and the average of the prior four. Acadia Healthcare and Resolute Forest Product, each exhibited a large change in sentiment relative to prior events with a corresponding change in price performance. Prattle’s scores can also be applied within quantitative models. The dataset is thoroughly time stamped and contains a deep history that supports time series analysis. This type of application is highly dependent on the performance of Prattle’s predictions and the actual outcomes. Prattle defines performance as the correlation between Prattle CARs and realized CARS (actuals). Figure 6 examines these correlations for companies with at least 10 out-of-sample earnings calls. Overall, the distribution highlights a moderately positive relationship for most firms. 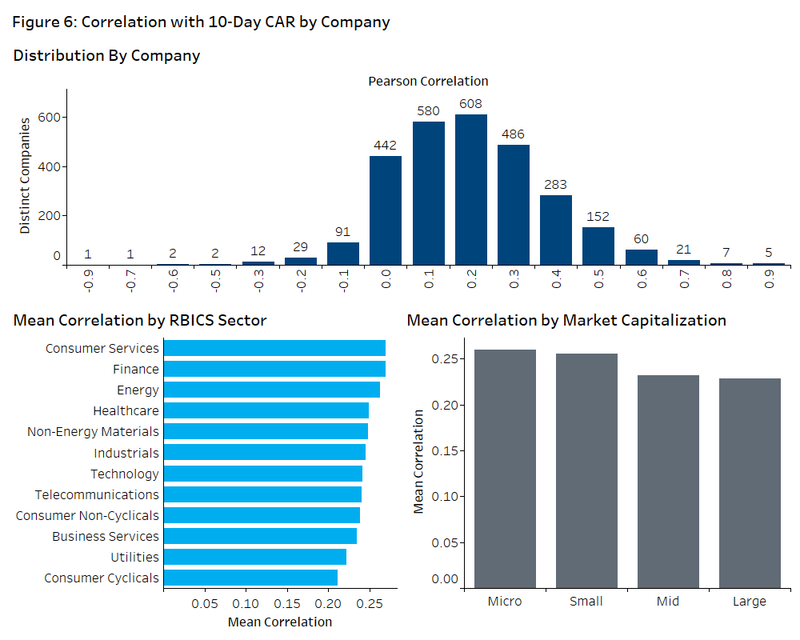 Correlation strength varies by RBICS sector and market capitalization class. 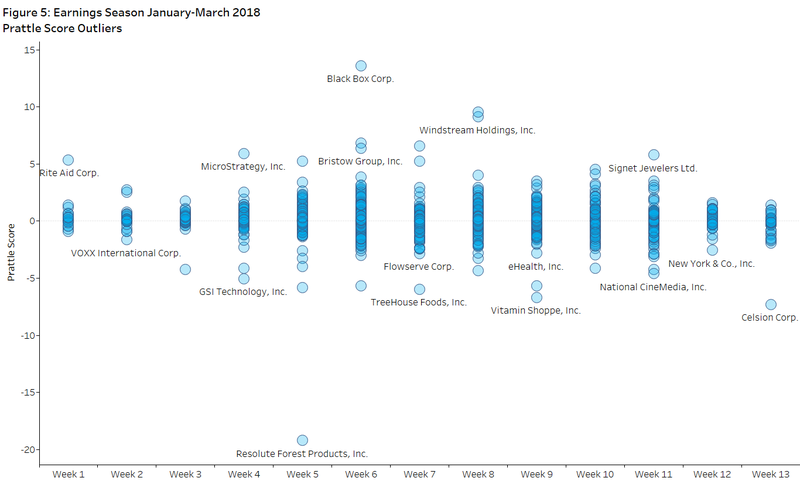 Consumer Services (.27) and Finance (.27) own the strongest average correlations, while micro (.26) and small (.26) cap stocks slightly edge out mid and large cap stocks. Figure 7 portrays Prattle’s ability to control for fundamentals and extract the impact of language on price movement. From October 31, 2017, to May 2, 2018, Kellogg’s stock price had declined ~8%. The decline was fueled by concerns of slowing growth in key business units and underperformance relative to peers. Each of the earnings calls produced a temporary short-term boost to Kellogg’s stock price. Prattle’s CAR Score, derived from the language of each call, was successful in predicting these fluctuations. Prattle’s Equities Analytics scores capture the expected change in stock performance based on the linguistic patterns of a company. Applications of these scores can enhance existing factors or introduce efficiencies to the often manual and overloading task of listening to earnings calls. For more information on Prattle’s data, including case studies, white papers, and additional research, please visit their provider page on the Open:FactSet Marketplace.